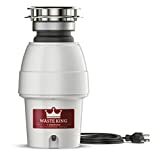 Overall, if you are looking for a durable, reliable, and cost-effective disposal solution for your kitchen, we highly recommend using the KitchenAid KCDB250G Garbage Disposal. One of the most practical modern convenience that we take for granted is the humble garbage disposal. In the US, most homes are equipped with this handy device, but that doesn’t mean that it will last forever. Depending on how often you use the machine, it may hold up for a few years, or up to a decade. 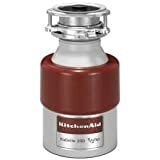 So, when the time comes to upgrade your old unit, you may want to check out something like this model from KitchenAid which is one of the top garbage disposal brands on the market. The Kitchen Aid KCDB250G 1/2 HP Continuous Feed Garbage Disposal gains many positive reviews from real users. Let’s see what it has to offer for your sink. 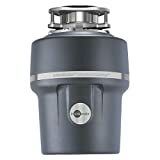 When looking at different kinds of garbage disposals, you will notice that the two primary types of garbage disposal are batch feed and continuous. If you are only tossing food into your sink every once in a while (such as one or two times a week), then a batch feed model will probably be a better option for you. However, for most households, a continuous model is the best thing to have because it allows you to grind as much food as necessary whenever you want. All you have to do is flip a switch, and it will stay on indefinitely, making it much more convenient than a batch-feed unit. One of the best ways to determine if you are getting a high-quality disposal is to check the amount of horsepower that you are getting. As a general rule, more is better, which means that this unit is superior to one that only has ⅓ horses. Another aspect of the motor to consider is the speed with which it grinds your food. Overall, you want something incredibly fast so that it will turn any particles into pulp immediately. This is crucial because it will help avoid clogs and keep your machine in pristine condition for much longer overall. In this case, the motor spins at 1725 rpm, which is more than enough to process most food that you will toss down the drain. Related: How to Choose the Right Garbage Disposal Size? While the motor is a critical component of any disposal, you also want to be sure that the rest of the machine is built as tough so that you know that it will last longer. This KitchenAid Disposal is made from high-quality stainless steel, including the impellers inside the chamber. Overall, stainless steel is perfect for this kind of device as it is naturally resistant to rust and corrosion. Not only that, but you can quickly sharpen your impellers by grinding ice cubes in the machine, which will also extend the life of your disposal. Simply put, if you take care of this device, it should last more than a decade without any significant problems. When we are talking about the process for installing this disposal being simple, we are talking about replacing an older KitchenAid model. 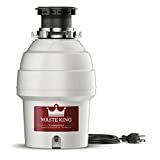 The reason for this is because each brand comes with a proprietary mounting system, meaning that when you upgrade to a newer version all you have to do is disconnect the pipe, unscrew the disposal, and then replace it. If, however, you are either putting this disposal under a sink that doesn’t currently have one, or it is another brand, then the installation process will be a bit more complicated. Still, you should be able to get it done in an hour or two, but we want you to keep that in mind. Safety is always a priority when dealing with high powered machines like this, which is why the KitchenAid disposal comes with an overload protector so that if it gets clogged or the impellers stop spinning for any reason, the whole thing will shut off automatically. Do you recommend that I install this myself? If you are replacing an old KitchenAid disposal, then you can most likely handle the work involved. If you are switching from a different brand or installing a brand new one, then we recommend using a professional service. Do I have to buy a power cord to use this disposal? If you keep the one from your old unit, then it should work fine. However, if you are putting in a new disposal where there wasn’t one before, then yes, you will need a power cord. According to the manufacturer, it is about seven inches wide and twelve inches long.